Now that Halloween is a mere week away and outlets all over the Internet, including us, are highlighting, ranking, and reviewing the scariest legends surrounding cemeteries, abandoned hospitals, and haunted houses across America, it's a good time to remind people what happens when paranormal investigation goes wrong. There's no better demonstration for the dark side of supernatural obsession than what happened with St. John's Anglican Church. Hidden in a forest in rural Quebec, St. John's was built in 1858 by British and Irish settlers in the town of Laurentians. The tiny church was nothing to look at, but it was built well and outlived generations of worshippers who eventually left it behind. As the community gradually shrank into a ghost town, the church became the last remnant of Shrewsbury, a Scottish and Irish settlement founded in the 1820s. Somewhere down the line, the church's worn-down appearance and relatively desolate location led to whispered tales of mass suicide, Satanic cults, and of course, stories about brushes with the sorrowful ghosts trapped in its walls. As the rumors surrounding the church grew, so did the visits from those looking for a supernatural thrill, and St. John's became the place to go for weekend trysts with the dead. Unfortunately, the church's name became listed on more and more ghost hunting websites attached to stories that were more and more exaggerated and extreme. Enraged locals who had heard about "black masses" being conducted by local Satanic cults would often break in, searching for the shadowy figures, causing untold damage in the process. Some would hack off chunks of gravestones from the cemetery as a keepsake. Others would destroy the property just for fun. Over the past few decades the little church survived destruction, defecation, robbery and vandalism. The bells were stolen from the bell-tower on three separate occasions during the past three decades alone. The interior and exterior of the building were attacked with axes, hammers and spray paint and many of the tombstones were toppled and defaced. Finally, in 2010, the Anglican diocese, frustrated at the lack of police presense and their inability to protect the property, deconsecrated the building. The local municipality of Gore had plans to acquire government grants and renovate the church, using it as a community center, but sadly, it didn't last long enough. On January 12 of this year, it burned to the ground. Some say that the fire was caused by candles used in an unauthorized seance to contact the spirits of the dead. 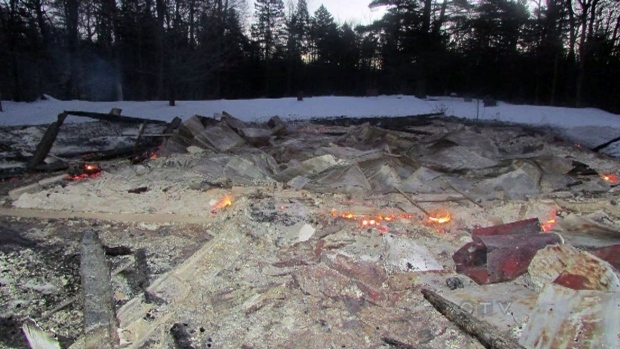 In an instant, the last remnants of a ghost town's history were destroyed in a blaze caused by ghost hunters. As sad as this story is, it's not an uncommon one. Just last year, one ghost hunting team destroyed a rich piece of Louisiana history by setting it on fire. The suspects told authorities that they snuck into the LeBeau Plantation House in order to investigate claims that the building was haunted. Unfortunately for everyone, many news outlets reportedthat these ghost hunters had more in common with Shaggy and Scooby than with Fred and Velma, because instead of actually solving any mysteries they just got high and accidentally set fire to the building. Stories of destruction like this are a good reminder that whether you're heading to a paranormal hotspot like The Alpine Portal, chasing the White Lady of Union Cemetery, or deciding to try your luck by daring to touch the cursed The Black Angel of Oakland Cemetery, you should do your best to adhere to the urban explorer's code: take nothing but pictures, leave nothing but footprints. This way future generations can experience the same locations you did, whether or not they care about history or just the things that go bump in the night. Like stories like these? Friend me on Facebook or follow me on Twitter for more of the coolest, offbeat travel content delivered straight to your social feeds! Plus, I know some killer fart jokes.